Product Group: Retail Displays Bookmark To MyTotalUSA! Acrylic countertop display. 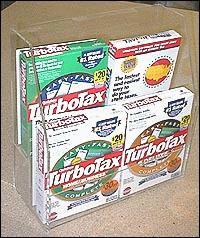 Designed for attractively displaying your software packages in your retail store. Two tier rack holds up to 8 software titles. Pocket size: (2) 16" wide x 3.5" deep. Overall height of rack 17.5"
Available in quantity, with price breaks.